After all, the Bucs have a new coach and when you can get someone like Greg Schiano, who took Rutgers to the middle of the all-powerful Big East, well you just have to let him call the shots. “(Schiano) said he was kind of upset that I wasn’t there working with the team in the offseason and for the first week of OTAs,” Winslow told the hosts of the The Opening Drive on Sirius NFL Radio. Tampa likely shares the same concern the Browns did when they traded Winslow following the 2008 season – while he is talented and only 28, Winslow has the knee of an 80-year-old, and the thought of paying him base salaries of $3.3 million, $4.5 million, and $5.5 million over the next three years is more of a risk than Tampa probably wants to take. Winslow is one of those Only in Cleveland stories that fans have come to know all too well over the years. Hugely talented when he was drafted out of Miami in the first round of the 2004 draft, Winslow broke his leg two games into his rookie season (during the Jeff Garcia 0.0 game, talk about an OIC moment) and missed the rest of the year. An ill-advised motorcycle stunt cost him the entire 2005 season and the ACL in his right knee. 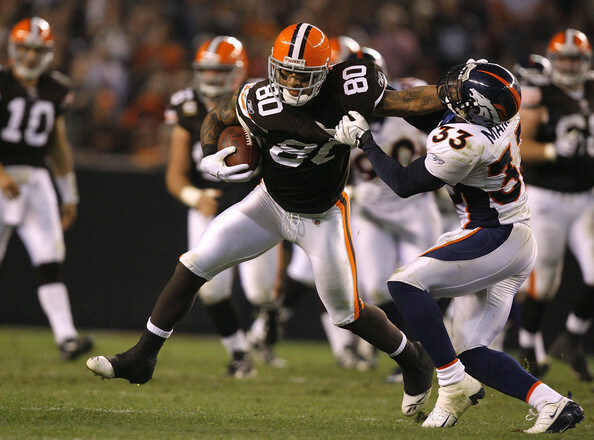 Winslow came back to play 16 games for the Browns in both 2006 and 2007 (earning a Pro Bowl selection), catching 89 passes and 82 passes respectively. After another injury-plagued season in 2008 the Browns, fearing giving Winslow big money because of his injury history and feeling some heat about comments Winslow made toward then-GM Phil Savage (which turned out to be entirely correct), Cleveland shipped him off to Tampa. We still think if Winslow had never been injured the Browns would have found a way to make it work with him; after all he is the best tight end the team has had since Ozzie Newsome retired in 1990. They could have lived with his attitude if he hadn’t been injured because of his talent (unlike Braylon Edwards). But that’s the way it works in Cleveland, the land of the eternal what if. Winslow played every game in his three years in Tampa, averaging 73 catches a year and four touchdowns. He’s also played in every game in five of the past six seasons, so here’s hoping he can still be productive in Seattle. Paul Lukas of UniWatch fame had an article in the June issue of Print magazine looking at what could potentially happen if teams in the Big 4 sports started selling ad space on their uniforms. If you are a regular reader of UniWatch you won’t be surprised by the contents of the article, but it is worth a read, mainly because you have to wonder how much longer owners are going to turn their backs on a potential revenue stream. And if the day ever comes it will most likely be a mess. While the leagues would hopefully try and regulate the size and placement of the ads, it’s not hard to imagine certain owners deciding they are above the law and just doing whatever they want to grab a bigger piece of the pie. Plus you know the potential sponsor is going to try and force its own ideas onto jerseys. It’s also not hard to imagine a mid-market team that struggles to draw fans even when it is winning, looking at the opportunity to close the revenue gap with other teams in its division by loading up a uniform until it looks like something from NASCAR. Not that we know of any team in that situation, of course. Will this fall be the last season we see Josh Cribbs in a Browns uniform? It’s a possibility, as Jeff Schudel points out in The News-Herald. Cribbs is entering the final year of his contract and his biggest contribution to the Browns, as a kick returner, has been diminished with the recent NFL rule changes. Plus, Cribbs will turn 30 next off-season and players don’t get better after they hit 30. Cribbs is clearly one of the best things to happen to the Browns since they returned in 1999 and it will be hard day when the time comes for the Browns to part ways with the former Kent State quarterback. Finally, we’ll be at the Tribe game tonight in the dugout suite with some of our fellow writers from The Cleveland Fan. Don't pin the “Only in Cleveland” moniker on Winslow. It was HIS stupidity that nearly ended his life & cut his football career short – plain & simple. Winslow crashes his motorcycle in a parking lot while going 5 mph and ruins his knee. Ben Roethlisberger crashes his motorcyle in traffic, on a bridge, without wearing a helmet and basically walks away without any long-term impact.